At least one pre-season magazine believes the Iowa State football team will return to bowl contention next season. The Cyclones have missed out on the post season the past two years and finished 2-10 overall in 2014 and winless in the Big-12. Publisher and college football prognosticator Phill Steele says ISU will be improved in virtually every phase, from quarterbacks to defensive backs. Steele says the Cyclone offense will make major strides after finishing eighth in the Big-12 in scoring last year. “I’m excited about those receivers…this is a very good Iowa State receiving corps, I think they’ll get better quarterback play, the offensive line looks solid,” Steele says. Steele says Iowa State coach Paul Rhoads always overchieves and beats his predictions, as he has not called for the Cyclones to get to a bowl game in Rhoads’ tenure and they have gone to 3. 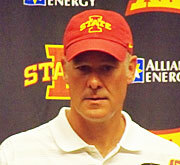 Steele expects the Cyclones to return to exceeding expectations under coach Rhoads. He says last year he projected the Cyclones would be near the bottom of the conference and they were. But this year, he says they will be underdogs in at least 10 games and he expects them to pull some upsets. The Cyclones open the season at home on September 5th against UNI. Phil Steele’s College Football Preview will be on the newsstands on July first.